Mr Willy Wonka, the most wondrous inventor in the world, opens his gates of his amazing chocolate factory to five lucky children. Gobstoppers, wriggle sweets and a river of melted chocolate delight await. Charlie needs just one Golden Ticket and these delicious treats could all b... read full description below. Phizz-whizzing new branding for Roald Dahl, the world's No. storyteller! Exciting, bold and instantly recognisable with Quentin Blake's inimitable artwork. This is the famous story of Charlie Bucket and his Golden Ticket, and Willy Wonka and his amazing chocolate factory. Mr Willy Wonka, the most wondrous inventor in the world, opens his gates of his amazing chocolate factory to five lucky children. Gobstoppers, wriggle sweets and a river of melted chocolate delight await. Charlie needs just one Golden Ticket and these delicious treats could all be his! The ultimate children's story ever. (David Walliams). 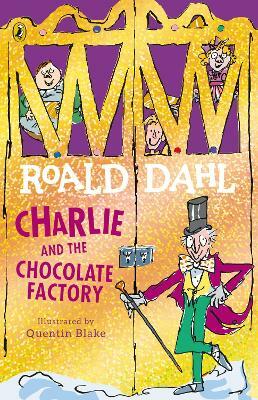 Now you can listen to Charlie and the Chocolate Factory and Other Roald Dahl audiobooks read by some very famous voices, including Kate Winslet, David Walliams and Steven Fry - and there are added squelchy soundeffects from Pinewood Studios! Look out for new Roald Dahl apps in the App store and Google Play - including the disgusting Twit or Miss! and House of Twits inspired by the revolting Twits.